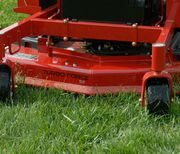 Toro's outstanding development in the zero turn industry is evident through their high quality products and the Toro Z Master 3000 is no exception. This commercial grade product comes with a huge 60" TURBO Force cutting deck made from 7 gauge steel. The huge 1 inch steel spindle shafts also ensure the cutting deck is robust enough to handle tough conditions. Powered by a mammoth V-Twin Kohler engine its EFI technology will ensure you have all the power you need and more. Safety is also paramount in the design and construction of Toro machines which is why you can mow in comfort with the 3000 series fitted with a foldable roll bar and a seat belt for your convenience. More information don't hesitate to drop in, call, or view videos and specifications below. Terms & conditions apply to finance options. Kawasaki is arguably the most reliable and durable engine on the market with a huge 25.5hp and 852cc you will never be lacking in power. 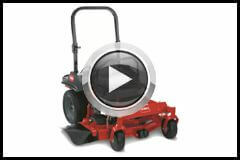 The Toro exclusive high strength cutting deck is designed and manufactured to withstand the toughest conditions. Made from high strength 7-gauge steel while still delivering the ultimate cutting performance and finish. Toro's 3000 series is equipped with high commercial grade spindle assemblies with a durable cast iron housing and solid 1 inch steel spindle shafts acting to absorb large impacts and spread them across a broader surface reduce the impact. Toro's high-tech unitized pump and wheel motor incorporates proven commercial hydraulic components while eliminating hoses and other potential leak points. This in return provides you with a smooth, faster response when steering producing a more dependable machine. The high quality heavy duty air filtration system protects the engine from contamination and damage extending its life and efficiency. Safety is a huge aspect and concern to Toro when designing their products which is why their ROPS and seat belt application is standard across all commercial grade machines. Protecting the operator in the unlikely situation that they where too roll or tip the machine. The roll bar can also be easily folded without the use of tools so the machine because more accessible to different areas such as under trees.